It being Monday, the first day of the week after a long week, I felt like spicing up my outfit. 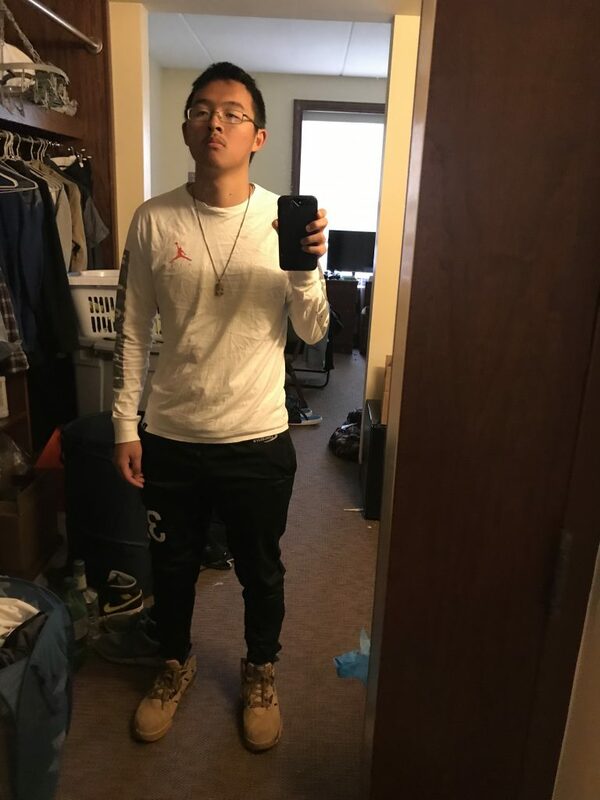 For today, I chose to wear a long sleeve white Jordan shirt with cement print on the sleeves, some Disc Store Ultimate Frisbee Tapered pants, and my Nike Sneakerboots. The long sleeve Jordan shirt is one that I got a couple months ago as a gift from my friend. It is very comfortable and lightweight. The Disc Store Tapered pants are usually used when I play Ultimate Frisbee, but when I am not playing, they are a sleek and perfect fitting pair of pants to wear casually. The Sneakerboots were worn for this day because of the possibility of snow or rain, and the boots do a great job of keeping my socks and feet dry. This outfit is a casual outfit that has a good contrast between the black pants and the white top. As always, my Jesus piece is a nice accesory to the whole outfit. Overall, the whole fit is very stylish and all the colors go well together. Its applicability to many different weather conditions makes it perfect for Ohio’s ever changing weather. Jordans are hot so you = hot!! !